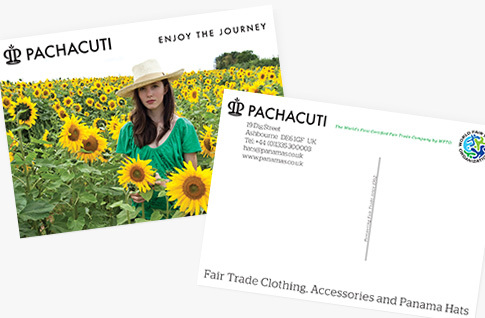 Postcard printing with a choice of A5, DL and A6 sizes. Printed to an exceptional standard onto high quality 400gsm Silk card - which is perfect for writing on. Available with an optional luxury Gloss Lamination to 1 side. They are highly effective when used in the traditional way; with an attractive photo to the front and a space to write on the reverse. Leave a lasting impression on the recipient with a bright and bold design. Printed Postcards are an extremely cost effective way of promoting your business and although more traditionally used in the tourism sector; these versatile products are popular with many businesses such as fitness clubs and health centres. They are great for promoting events and offers to existing and prospective clients. If you are not looking to use your Postcards in the traditional way, i.e. writing an address on the reverse, then please take a look at our 400gsm Flyers. These are essentially the same product, however, no VAT is applicable. · Printed customer addresses (Direct Mail)?